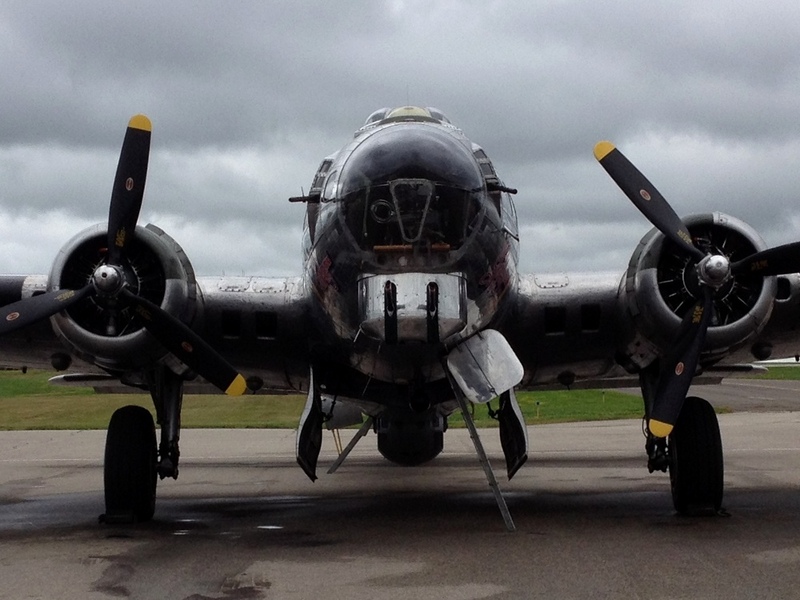 “Sentimental Journey” is a beautifully restored Boeing B-17G Flying Fortress. Operated by the Commemorative Air Force in Mesa Arizona and it’s been a favorite at airshows around the country. At airshows she attends, guest can purchase rides or take a tour through the aircraft. Classified as a heavy bomber by the Army Air Force during World War II the G model of the B-17 can be easily identified by its distinctive remotely operated chin turret. Over 8,600 B-17G’s were built during the 2nd world war. This one was built by the Douglas Aircraft Company in 1944 and upon completion was assigned to the pacific theater of operations. For several years after the war it was a photo reconnaissance aircraft in the pacific. It was then converted to a remotely operated drone for monitoring of A-bomb testing in the pacific Atolls. Afterwards, it ended its military career and was retired to Davis Monthan air force base for salvage. Before being scraped, it was purchased by a private company, converted into a water tanker and started a new career as a fire bomber. In 1978 she was donated to the Commemorative Air Force in Mesa Arizona. 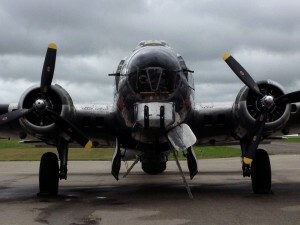 They restored it to its original B-17G configuration and the restoration project was completed in 1985. Instead of OD green paint it was given a bare aluminum finish. 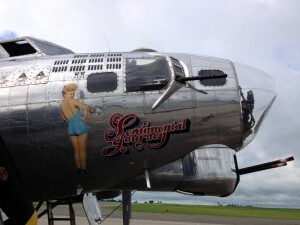 The nose was painted with a pinup of Betty Grable and the aircraft was named “Sentimental Journey”. To see where “Sentimental Journey” is today, go to flightaware.com and type in her registration N9323Z. Maximum takeoff weight 64,500 lbs. 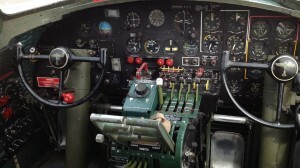 This entry was posted in Uncategorized and tagged air show, aircraft aviation, b-17, b-17 flying fortress, b17 cockpit, boeing b-17 flying fortress, bomber, caf, commemorative air force, history, instrument panel, military aviation, us army air force, world war ii, ww2, wwii on August 19, 2013 by James Sorsby.